When he wasn’t doing impersonations of Arnold Schwarzenegger and Michael Jackson over the loud speaker and mockingly crying after receiving a key to the city, Dwight Howard was asked if he looked better in the Orlando Magic’s new pinstriped uniforms than Shaquille O’Neal did a dozen years ago. 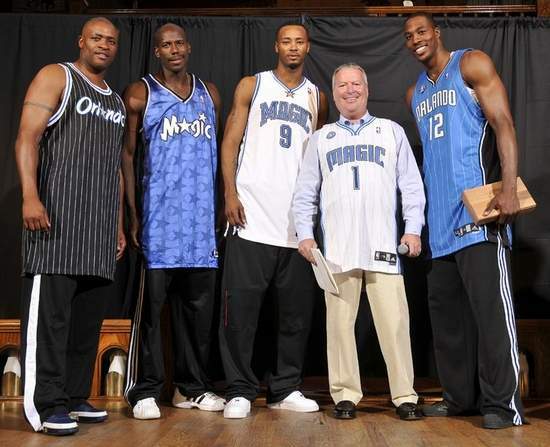 The Magic unveiled their new look on Tuesday, and not surprisingly it looked much like the team’s uniforms from the past. 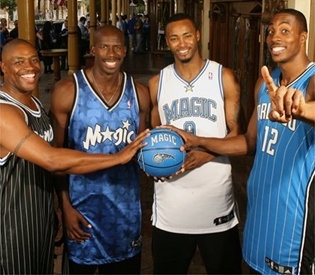 The new uniforms, with flared pinstriping and black side paneling, is a nod to the franchise’s previous four uniforms in this the 20th anniversary season of the Magic. And what better person to model the new uniforms than Dwight Howard, the muscular, playful face of the franchise. Howard preened and pranced on the runway Tuesday afternoon, showing off the blue road uniform before about 200 fans. The Magic wore Champion-brand pinstripes on their uniforms from 1989 through 1997 and Champion-model “Dazzle” with side-paneled pinstripes from 1999 to 2002. They ditched the stripes the past five seasons, but brought them back as a tribute to the inaugural team from 20 years ago. Like before, the home jerseys will read “MAGIC” across the chest, while “ORLANDO” will be across the away jerseys. The 20th anniversary patch is on the right upper chest and Magic logos are on the shorts and the back of the jersey. Blue road jerseys remain after the NBA nixed the Magic’s plan of reintroducing black jerseys. But the new look seemed to go over well with fans on Tuesday who lined up to buy the new apparel. The uniforms are already on sale at orlandomagic.com. The Magic open training camp on Tuesday in Orlando, and the exhibition season begins Oct. 6 at home against Atlanta. The regular season begins Oct. 29, also against the Hawks. Howard was presented with a proclamation and a ceremonial key by City of Orlando mayor Buddy Dyer as a nod to him winning a gold medal with Team USA’s basketball squad in the Summer Olympics. Howard was ever playful on Tuesday, faking tears when being addressed by Dyer and egging the crowd on with his many impersonations. And he received a thunderous ovation when he talked of the Magic’s hopes of trying to win a championship this season. Howard said he took a week off after returning from the Olympics and has been working out with his Magic teammates for the past three weeks. Howard said not getting complacent after winning 52 games, a Southeast Division crown and a playoff round is a mantra already for the Magic. Magic forward Rashard Lewis, who was also a part of Tuesday’s show along with past standouts Nick Anderson and Bo Outlaw, said the intensity of Orlando’s pre-camp workouts prove that the Magic are serious about trying to do something special this season. This entry was posted on September 25, 2008 at 10:19 pm and filed under Dwight Howard,NBA. You can follow any responses to this entry through the RSS feed.